Recovery Toolbox, one of the leading developers of compact and efficient data recovery tools for popular software products, presents a major functional update for Recovery Toolbox for OneNote. 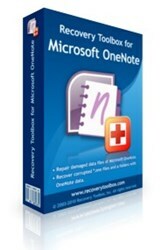 This advanced OneNote recovery tool with a user-friendly interface turns data restoration into a extremely simple task that even complete novices can handle without any problems. This advanced OneNote recovery tool with a user-friendly interface turns data restoration into a extremely simple task.